J.D. 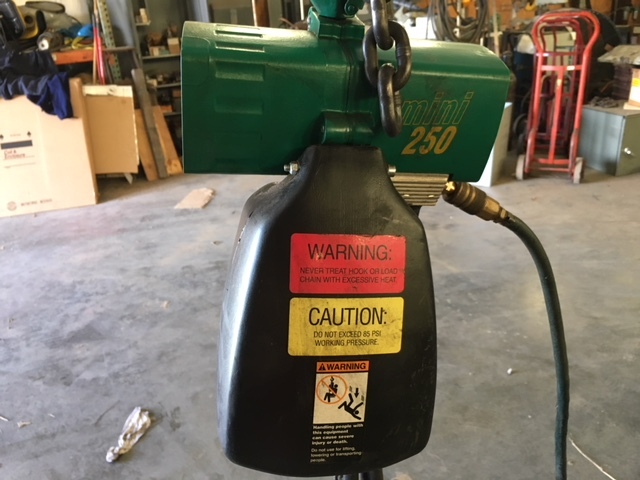 Neuhaus Mini 250/3 air hoist. Capacity: 550 Pounds, Lift Height: 10 Feet, Control Cord 6 Feet, Suspension: Hook, Lift Speed: 26 FPM Full Load, Lowering Speed: 52 FPM Full Load, Weight: 23 Pounds Headroom: 16.7”, Single Reeved. Includes Chain Container.